Chicago –The National Dental Association (NDA) Chicago chapter, the Lincoln Dental Society and several community partners will collaborate to promote February’s National Children’s Oral Health Month on Friday, February 15, 2013, with a “Brush-A-Thon” at the St. Elizabeth’s Hall for St. Elizabeth Catholic School, 50 East 41st Street, Chicago, IL. from 9 a.m.- 12:00 p.m. The project is funded by a grant from the Links Foundation, Incorporated, and is a component of NDA-HEALTH NOW™, a community-based , national project to address disparities in health and oral health in African American comm unities and communities of color. Dr. Sheila Brown, NDA Past President, is the NDA-HEALTH NOW-Chicago™ Project Director. NDA HEALTH NOW™ stands for “Health, Equity, Access, Literacy, Technology, and Hope. National Outreach on Wheels. Community partners assisting in the new initiative are: the African American Dental Hygienists’ Association, Alvenia Rhea Albright & Associates, LLC, Chicago Dental Society Foundation, General Electric’s African American Forum, Illinois Department of Public Health, Oral Health America, Plano Child Development Center, Renaissance Adult Center, St.Elizabeth’s Catholic Church, University of Illinois at Chicago (UIC) College of Dentistry, UIC School of Public Health, and the UIC Student National Dental Association. NDA-HEALTH NOW™ will be introduced in New Orleans, New York, Chicago, Dallas and San Francisco/Oakland to provide fully equipped mixed-use Mobile Health Units (MHUs) staffed by salaried and volunteer, inter-professional teams- dental, medical and vision care practitioners. NDA-HEALTH NOW™ seeks to replicate key features and best practices of the successful and proven Deamonte Driver Dental Project in Prince George’s County, Maryland. The project design features programming both with and without the MHUs to provide resources, services and education to underserved, inner -city communities. The MHUs are outfitted to provide each patient with dental screenings and treatment, and additionally, with health screenings (blood pressure, glucose, and cholesterol), immunizations and flu shots, and vision screenings. Past experience with mobile clinics has shown that less than 1% of dental patients are untreatable in such a facility. The NDA mobile clinics will leverage the time and efforts of volunteer dental, medical and vision care practitioners so that maximum benefit is received by patients in underserved and not-served communities. Early indications are that each dollar spent on mobile clinics results in multiple dollars’ worth of needed services to patients. Washington DC- The Lincoln Dental Society (LDS) received the coveted Colgate Award on July 28, 2013 during the National Dental Association (NDA) Centennial Convention at the Gaylord National Resort in National Harbor, MD minutes away from Washington, DC. The award was presented by Dr. Marsha Butler, Colgate’s Vice President for Global Professional Relations & Marketing at the 21st Annual Colgate President’s Luncheon. Dr. Sheila R. Brown (pictured above left) accepted the award on behalf of Dr. Albert Gruber, President of the Lincoln Dental Society. The LDS won the Colgate Bright Smiles/Bright Futures Community Service Award for “outstanding contributions to community outreach.” Entries were evaluated on their originality, quality and relevance to improved oral health for NDA chapter programs in operation from June 30, 2012 to June 15, 2013. In 2012, motivated to do more, and inspired by the far reaching impact that the Colgate “Brush-a-Thon” could have in the metro-Chicago area, the Lincoln Dental Society (LDS) incorporated this educational program into a new, community-based, grassroots oral health project. The new project falls under the umbrella of the National Dental Association and is called: NDA- HEALTH NOW™, which stands for “Health, Equity, Access, Literacy, Technology, and Hope. National Outreach on Wheels. 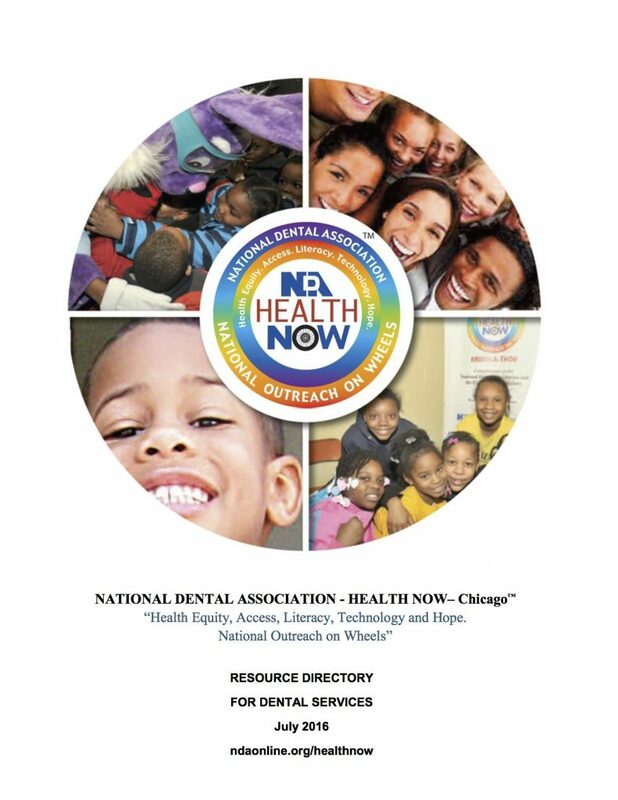 The NDA-HEALTH NOW™ is a national community-based project to address disparities in health and oral health in African American communities and communities of color. The project planning grant was funded by the Links Foundation, Incorporated. American Forum, Illinois Department of Public Health Division of Oral Health, Lake Shore Chapter of the Links, Incorporated, Oral Health America, Plano Child Development Center, Renaissance Adult Center, St. Elizabeth’s Catholic Church, University of Illinois at Chicago (UIC) College of Dentistry, UIC School of Public Health, and the UIC Student National Dental Association. The “Brush-A-Thon” is an interactive, child-friendly, oral hygiene instructional program, which is a feature of Colgate’s award winning Bright Smiles/Bright Futures program that targets inner city children. Program events include: A visit from Colgate’s Dr. Rabbit, oral health educational videos, tooth brushing techniques, music and entertainment, and “goody bags” with children’s dental products donated by Colgate. Often, screenings and referrals on the Bright Smiles/Bright Futures mobile dental van are also provided. From the two outreach experiences, the LDS not only achieved the goals of the Colgate inner-city children’s educational program, but also 1) recruited and engaged community partners, 2) developed a template and “tool kit” that will allow the program to be replicated in other schools throughout the region, 3) recruited Dr. David Miller (NDA member), the Chief Dental Officer of the Illinois Public Health Department to be a key participant in both programs, 4) provided “hands-on” training for the community partners to continue and expand the program, and 5) motivated teachers to incorporate oral health into their health curriculum. For over two decades, Colgate and the NDA have been partners in promoting children’s oral health in vulnerable, underserved urban communities. NDA dentists, students, hygienists and assistants have volunteered on the Colgate Bright Smiles, Bright Futures mobile dental van across America and touched the lives of millions of children and their parents. The goal has always been to educate, screen and refer for treatment. As a result of the LDS/NDA-HEALTH NOW-Chicago™ Award winning programs, the community partners have asked the LDS to expand the program to other schools.